Medicine is calling it quits. Financial District: When Medicine Eatstation suddenly closed for "renovations" a few weeks ago, more than a few FiDi denizens got worried, especially considering that there were clearly no renovations at work within. Things got worse when the supposed week-long hiatus quickly evolved into several weeks without explanation. 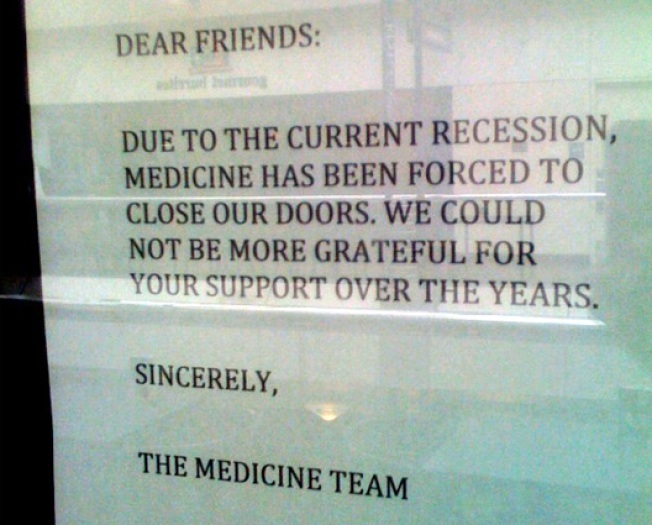 Now comes the news everyone has been expecting: citing the recession as the ultimate cause, Medicine won't be coming back. Godspeed.